: Montréal chef Hugue Dufour stirred up the New York dining landscape when he opened M. Wells in an old diner space in Queens (now M. Wells Dinette at MoMa PS1). He’s done the same in the steakhouse world with this mecca of meat in Long Island City. 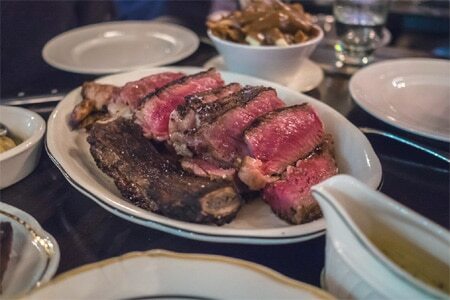 Housed in a former body shop garage, M. Wells Steakhouse exudes a fine balance of both warmth and hipness. The menu, as you’d expect from Dufour, is loaded with meaty goodness --- though not all of it works. Foie gras gnocchi are not really gnocchi but more like hardened buns stuffed with bland foie gras, and the bone-in burger fails in its overly gimmicky appearance. The lobster roll, however, is piled with buttery crustacean, and the coquilles Saint Ferréol, baked scallops topped with mashed potatoes, is like a shepherd’s pie of the sea. Both are worth ordering. But the main event is the steak. The massive côte de boeuf is well executed, charred crispy on the outside and juicy pink on the inside. Choose as well from a pork chop with anchovy butter, and a bone-in grass-fed lamb saddle, which arrives with chickpeas and Greek yogurt. The dessert cart, with its beet-infused red velvet cake and Pavlova, will most certainly tempt. The lengthy wine list includes a few interesting surprises, such as very drinkable selections from Utah and an underrated region in Sicily.